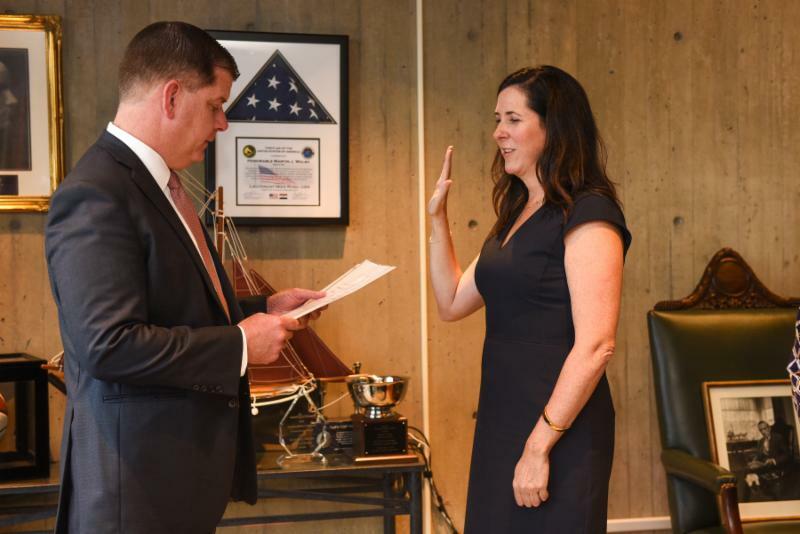 BOSTON - Tuesday, October 9, 2018 - Mayor Martin J. Walsh today announced the appointment of Kathleen Joyce as Chairwoman of the Boston Licensing Board, a regulatory board that grants and regulates various types of food and alcohol licenses for restaurants and other establishments in Boston. The Board is also responsible for holding hearings on violations and license applications. "The Licensing Board serves an important function in the City of Boston in making sure that our restaurants and entertainment establishments are regulated and in compliance with the law," said Mayor Walsh. "Kathleen has years of experience advising on legal and public policy matters, and I am excited that she will be able to take her extensive knowledge and expertise to Boston's Licensing Board." As Chairwoman, Joyce serves as the lead commissioner in regulating licenses pursuant to Massachusetts General Laws Chapters 138 and 140, and the Rules of the Board. The board consists of three commissioners who are appointed by the Mayor. Each commissioner serves a six-year term. "I am proud to be named Chairwoman of the Licensing Board, and thank Mayor Walsh for this incredible opportunity," said Kathleen Joyce. "My entire career has been grounded in providing legal support and promoting justice, and I am honored to be able to serve in this capacity." Joyce most recently worked as Senior Counsel at the Boston Planning & Development Agency (BPDA), the urban planning and economic development agency for the City of Boston. In her role as Senior Counsel, Joyce provided legal support and counsel on real estate, government and policy matters. Prior to joining the BPDA in 2014, Joyce spent nearly seven years working at the Boston Bar Association, a 10,000 member nonprofit organization, as the Director of Government Relations and Public Affairs, where she worked with organization's leadership teams to advance and coordinate policy positions to promote justice and improve access to the legal system in Massachusetts. Through her former roles, Joyce has accumulated extensive experience cultivating relationships with and convening various stakeholders to identify areas of common interest and consensus. These stakeholders include legal experts, city, state and federal leaders, and members of the judiciary. Joyce is a past member of the editorial board of Massachusetts Lawyers Weekly and serves as a committee member of The Friends of the Mass General Cancer Center and is a board member of the Dorchester Running Club and her alma mater, Mount Alvernia High School. She lives in Dorchester and graduated from the College of the Holy Cross and Suffolk University Law School. She will begin her new role as Chairwoman today on Tuesday, October 9, 2018.